What are these strange snare wires made of? What is this, a shoe string? A guitar string? 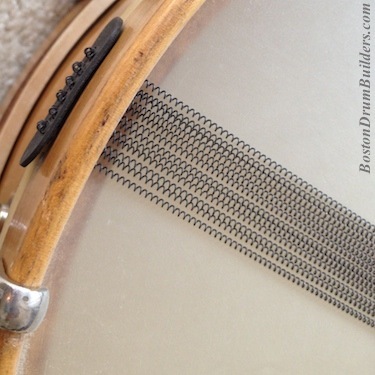 Are these snares original to the drum? 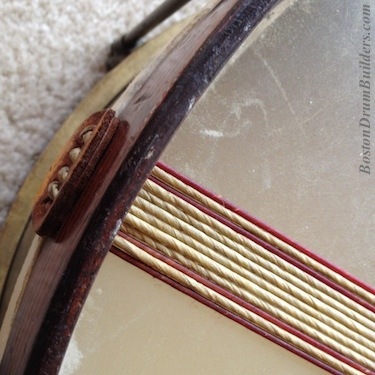 These are all questions raised upon unearthing a drum from the early 1900s. 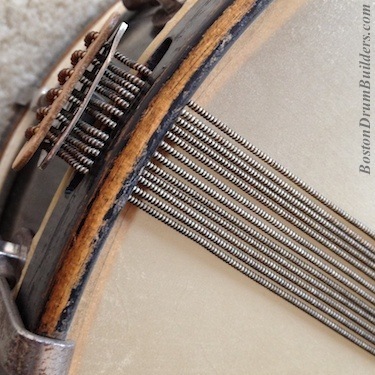 Snare wires back in the day were not what they are now. 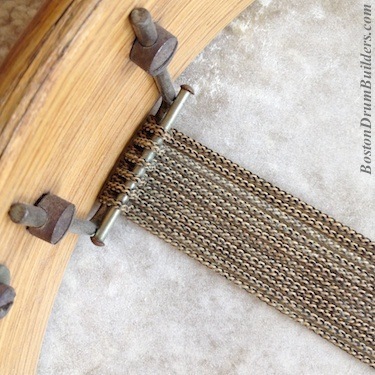 From the early days of American drum building, the material of choice was natural gut. Catgut, or "gut" for short, is made from the intestines of animals such as sheep or goat. No, it's not actually made from cats! Gut was also once used for other purposes ranging from guitar strings to tennis rackets. 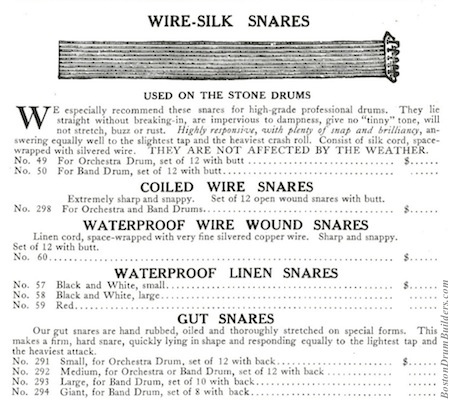 By the early 20th century, drum companies began offering other materials as alternatives to natural gut snares. 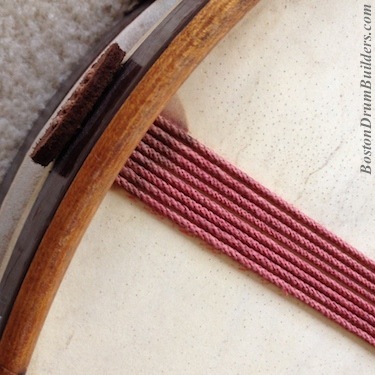 Here we will discuss the four most commonly seen types of snares used in the 1910s and 1920s by the Boston Drum Builders amongst others. Braided Linen was for a time used as a substitution for natural gut. It was catalogued under various names by different companies but it was essentially the same thing: waxed string. The advantages of linen string were that it was pliable and easy to work with, and was impervious to changes in temperature in humidity unlike natural gut. 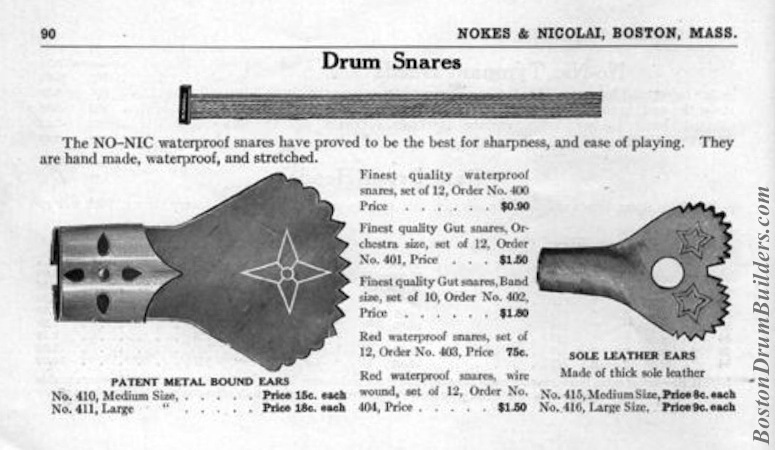 Linen snares were offered in a variety of gauges and in several different colors including black/white, and red. Wire Wound Silk is exactly that - a thin strand of silk wrapped with wire. Similar versions were offered with a core of linen or cord rather than silk. The concept is not unlike that of some guitar strings though the coil spacing is much wider on snare wires than guitar strings. Wire wound silk snares function a lot like gut but produce a brighter sound and, unlike natural gut, are impervious to changes in temperature in humidity. 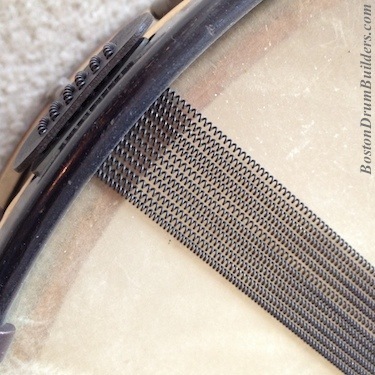 Excellent reproduction wire wound silk snares are currently available from, Adrian Kirchler who makes both a "European" and "American" gauge. The American gauge is a very accurate copy of what was used in the 1910s - 1920s by Ludwig, Leedy, Duplex, Stone, and Nokes & Nicolai amongst others. Coiled Wire, aka 'Snappy Wire', is just like the wire snares we see today only the strands were not soldered onto an end piece as they are now. 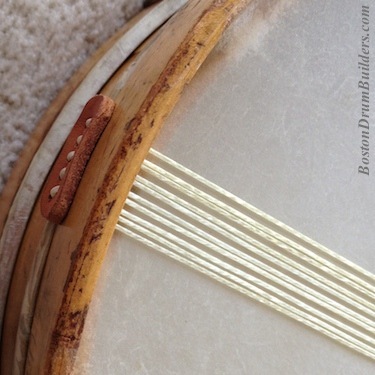 Instead, long strands of coiled wire were strung onto the drum in a similar fashion to gut or wire wound silk. With the growing popularity of the 'James Snappi Wires' through the 1920s, coiled wire mounted in this fashion soon became a thing of the past. The James Snappi Snares are nothing more than coiled wire soldered onto metal end pieces which can be more quickly and easily mounted on a drum. It is their simplicity of use and their bright, 'snappy' sound which have made this type of snare wire the most popular in the world today. Natural Gut is the most traditional material used for snares and is made from animal intestines. 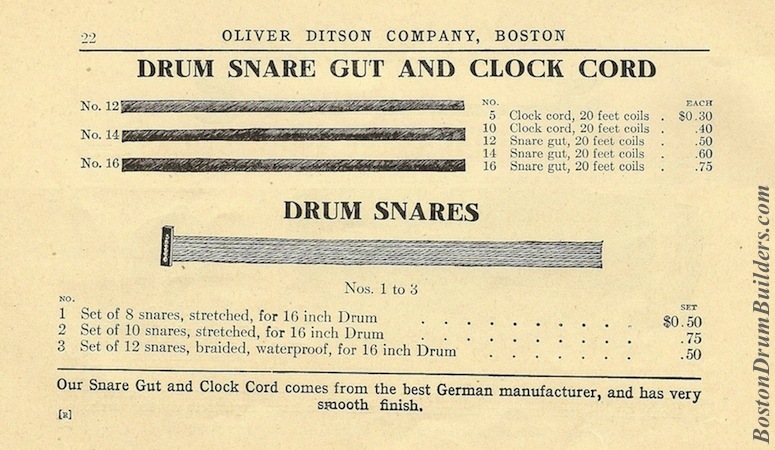 After the 1920s and 1930s, the use of gut began to fall out of favor as drummers moved towards the brighter sound of wire snares for modern styles of popular music. However, some symphonic percussionists continued to use gut as did many rudimental drummers who preferred the dark, dry sound it provided. Today, synthetic materials such as nylon cable or coated stainless steel cable have largely replaced natural gut. Natural gut can still be obtained from several sources including The Cooperman Company who carries it in several different gauges. 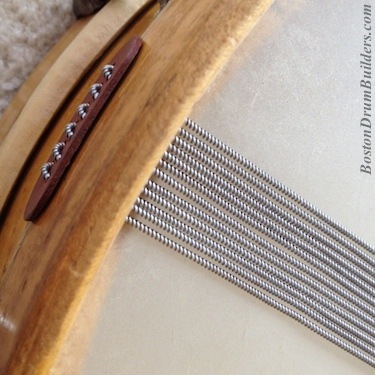 Their thinnest gauge is most appropriate for combo sized drums and symphonic use while their thicker gauges are best suited for field drums such as reproduction Revolutionary and Civil War rope tension drums.